Cal-Mil 3700-46 Mid-Century 3 Compartment Wood Flatware Organizer with Brass Accents - 9 1/2" x 6 1/2" x 5 1/2"
What is the best way to clean and care for my wooden item? All wood products should be hand washed. The heat and chemicals of a dishwasher are harmful to wood’s naturally porous texture. If your product begins to show signs of wear, its finish can be restored with a food safe wood conditioner. First, clean and dry the wood. Then, apply the wood conditioner with a soft cloth or paper towel. Once the conditioner has soaked into the item, buff off any excess with a clean cloth. Having excess conditioner on a wood board will make it feel sticky or oily. 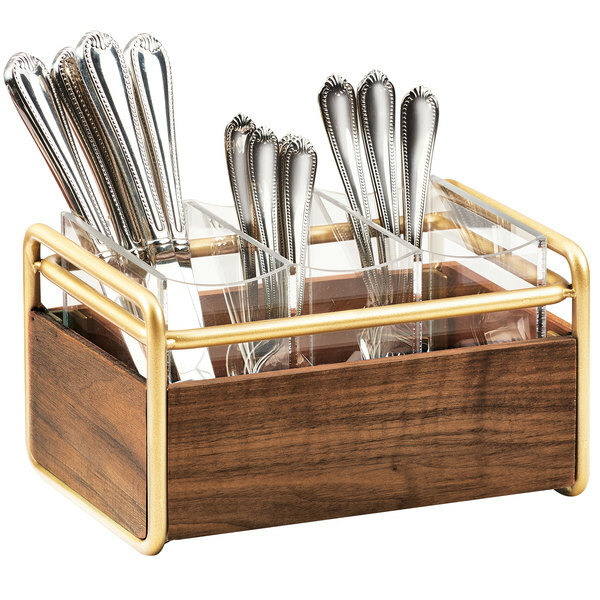 Take everyday essentials to the next level with this Cal-Mil 3700-46 Mid-Century 3 compartment wood flatware organizer with brass accents. Boasting an integrated plastic liner with 3 ample compartments, this organizer makes it easy to offer forks, knives, and spoons. It's perfect for catered events and hotel breakfast buffets, and can be placed next to your self-serve station for easy access. This flatware organizer helps keep your countertops neat and tidy for a professional look. Plus, the warm, walnut sides and brass accents give it an unexpected appearance that's great for vintage-themed venues and bed and breakfasts. Use it at your cafe, hotel, or lounge for a modern look with a rustic twist. Cal-Mil 3716-46 Brass Lid / Cup Organizer - 5" x 8 1/2"
Cal-Mil 3715-49 Mid-Century 3 Compartment Vertical Wooden Organizer with Chrome Accents - 6 1/2" x 6 1/2" x 19 1/2"
Cal-Mil 3702-12-49 Mid-Century Chrome Metal and Wood Ice Housing with Clear Plastic Pan - 14" x 22" x 7"
Cal-Mil 3709-49 Mid-Century Wood and Chrome Four Section Revolving Lid / Cup Organizer - 8 1/4" x 8 1/4" x 18"
Cal-Mil 1435-1224-78 Mid-Century Walnut Rectangular Riser Shelf - 24" x 12"
Cal-Mil 1435-1248-78 Mid-Century Walnut Rectangular Riser Shelf - 48" x 12"
Cal-Mil 3628-7-78 Mid-Century Walnut Square Crate Riser - 12" x 12" x 7"
Cal-Mil 3367-49 Mid-Century Walnut Cold Concept Cooling Base with Chrome Accents - 12" x 12" x 4 1/2"
Cal-Mil 3367-46 Mid-Century Walnut Cold Concept Cooling Base with Brass Frame - 12" x 12" x 4 1/2"
Cal-Mil 3723-49 Chrome Shelf Bracket - 20" x 13"
Cal-Mil 3702-6-49 Mid-Century Chrome Metal and Wood Ice Housing with Clear Plastic Pan - 7" x 8" x 7"
Cal-Mil 3702-6-46 Mid-Century Brass Metal and Wood Ice Housing with Clear Plastic Pan - 7" x 8" x 7"
Cal-Mil 3720-49 Mid-Century 13.5 Liter Walnut and Chrome Triple Canister Cereal Dispenser - 19 1/2" x 12" x 28 1/2"
Cal-Mil 3709-46 Mid-Century Wood and Brass Four Section Revolving Lid / Cup Organizer - 8 1/4" x 8 1/4" x 18"
Cal-Mil 3628-4-78 Mid-Century Walnut Square Crate Riser - 12" x 12" x 4"
Cal-Mil 3628-10-78 Mid-Century Walnut Square Crate Riser - 12" x 12" x 10"
Cal-Mil 3627-78 Mid-Century Walnut Square Crate Riser - 9" x 9" x 18"
Cal-Mil 3719-49 Mid-Century Chrome Beverage Cart with 2 Walnut Shelves - 27" x 16" x 36"
Cal-Mil 3716-49 Chrome Lid / Cup Organizer - 5" x 8 1/2"
Cal-Mil 3702-10-46 Mid-Century Brass Metal and Wood Ice Housing with Clear Plastic Pan - 11" x 14" x 7"
Cal-Mil 3707-46 Mid-Century 9 Compartment Wood Condiment Organizer with Brass Accents - 12" x 12" x 4 1/2"
Cal-Mil 3704-3-49 Mid-Century Wood and Chrome Three Tier Merchandiser - 13" x 12" x 26"
Cal-Mil 3702-10-49 Mid-Century Chrome Metal and Wood Ice Housing with Clear Plastic Pan - 11" x 14" x 7"
Cal-Mil 3704-2-49 Mid-Century Wood and Chrome Two Tier Merchandiser - 13" x 12" x 16 1/2"
Cal-Mil 3704-3-46 Mid-Century Wood and Brass Three Tier Merchandiser - 13" x 12" x 26"
Cal-Mil 3715-46 Mid-Century 3 Compartment Vertical Wooden Organizer with Brass Accents - 6 1/2" x 6 1/2" x 19 1/2"
Cal-Mil 3704-2-46 Mid-Century Wood and Brass Two Tier Merchandiser - 13" x 12" x 16 1/2"
Cal-Mil 3720-46 Mid-Century 13.5 Liter Walnut and Brass Triple Canister Cereal Dispenser - 19 1/2" x 12" x 28 1/2"
Cal-Mil 3719-46 Mid-Century Brass Beverage Cart with 2 Walnut Shelves - 27" x 16" x 36"
Cal-Mil 3707-49 Mid-Century 9 Compartment Wood Condiment Organizer with Chrome Accents - 12" x 12" x 4 1/2"
Cal-Mil 1435-1232-78 Mid-Century Walnut Rectangular Riser Shelf - 32" x 12"
Cal-Mil 3700-49 Mid-Century 3 Compartment Wood Flatware Organizer with Chrome Accents - 9 1/2" x 6 1/2" x 5 1/2"
Cal-Mil 3702-12-46 Mid-Century Brass Metal and Wood Ice Housing with Clear Plastic Pan - 14" x 22" x 7"
Cal-Mil 432-6-78 Mid-Century Square Walnut Wood Riser - 12" x 12" x 6"
Cal-Mil 432-3-78 Mid-Century Square Walnut Wood Riser - 12" x 12" x 3 1/4"
Cal-Mil 432-9-78 Mid-Century Square Walnut Wood Riser - 12" x 12" x 9"
Cal-Mil 4012-78 Mid-Century Center Cut Card Holder - 1 3/4" x 1 3/4" x 1 1/4"
Cal-Mil 4013-78 Mid-Century Diagonal Cut Card Holder - 1 3/4" x 1 3/4" x 1 1/4"
Cal-Mil 4014-78 Mid-Century Center Cut Card Holder - 3 1/4" x 3 1/4" x 1"